Each year in Orange County over 100 children are newly diagnosed with some form of cancer. Combined with children already undergoing treatment, hundreds of families share a common challenge as they are all dealing with stresses that are unimaginable to people who have never been touched by childhood cancer. Medical, financial, emotional, and social hardships can be overwhelming for patients, parents and siblings during treatment. With this in mind, the Orange County Foundation for Oncology Children and Families (OCF-OCF) provides support activities, free of charge, to pediatric cancer patients and their families who live or receive treatment in Orange County. 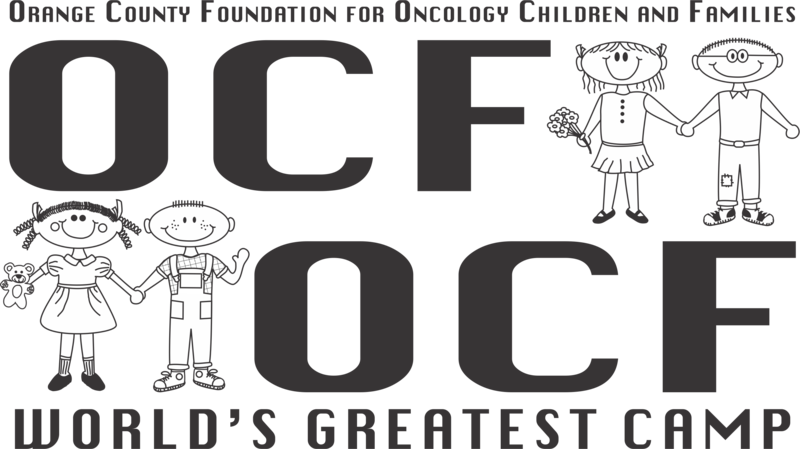 Born out of necessity in 1982, the Orange County Foundation for Oncology Children and Families (OCF-OCF) is a 501(c)(3) non-profit, volunteer-run organization providing year-round recreational and social activities designed to foster supportive relationships for pediatric cancer patients and their families. OCF-OCF activities are available to pediatric cancer patients and their families residing or receiving treatment in Orange County. OCF-OCF is run by a group of incredible volunteers. From the board members, who develop the support programs and raise funds, to the counselors, who work with the kids at camp, everyone gives generously of their time and of their hearts. Many of the volunteers are people who have benefited from OCF-OCF services in the past. Some are parents of cancer patients who want to make sure that the experience they had at camp will be available for those who will need it in the future. Some are young adults who came to camp as kids, or who lost a dear childhood friend to cancer. They dedicate many hours to training and planning so that they can participate in helping other children by serving as camp counselors. Throughout the year, OCF-OCF offers activities designed to strengthen the relationships begun at the “World’s Greatest Camp ” and “World’s Coolest Camp.” Both camps are provided free of charge to OCF-OCF participants.The “World’s Greatest Camp” is held in the San Bernardino Mountains in June and September. The weekend-long camp is open to patients and their families. The “World’s Greatest Camp” provides an opportunity for children and families facing the stress of cancer to unwind. Fun-filled activities such as horseback riding, archery, crafts, swimming, lake activities, a campfire, and a ropes challenge course are available for children and parents alike. Above all, the camp provides families with an opportunity to connect with others who can relate to what they are going through. Check our events page for upcoming activities.